Has your Pitbull been tought good manners yet? Do you always need to pull or jerk it to make obey? 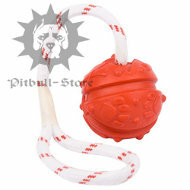 Try this pull tab short dog lead and handling of your misobedient Staffy will become much easier! 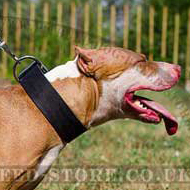 This dog control lead is also a godsend for you, if you have to often lead your Pit Bull out of the car or a bus. Be carefull, our pull tab dog lead is not a regular walking lead. You can attach a usual leash to this short dog lead due to floating O-ring on the handle and walk your pet. Our short dog lead is made of full grain leather with stitched snap hook. All the fittings are brass and non-corrosive. This dog control lead will serve your as long as you need. 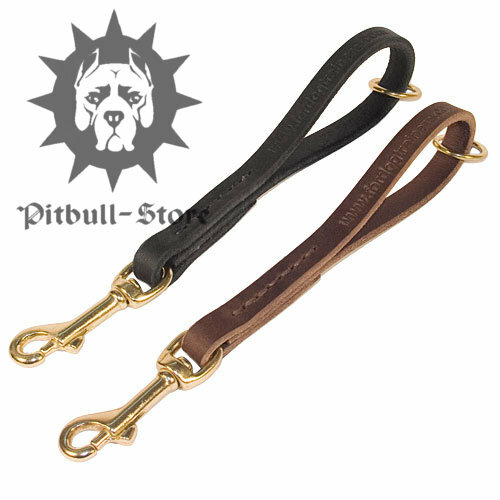 Quality and durability are the main strengthes of this pull tab dog lead. 1. Ladies and Gentlemen! Your parcel was delivered. Thank you kindly for your excellent service via e-mail (quick replies and helpfulness). Kind regards. 2. Good evening, My order has finally arrived. Thank you for the help in solving different serious problems I faced with. Thank you and best wishes for the 2016 year. 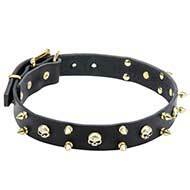 See also regular Leather Dog Leads for walking and training your beloved Staffy or Pitbull. Check our review Retractable Leash VS Usual Lead and choose the best for your Staffy. another high quality well made product from this store thankyou Katie uk. I inform you that the parcel has come today. Thank you again for your help.